RME HDSPe RAYDAT : RME's HDSPe RayDAT is a multi-channel, multi-format PCIe-based solution from recording, mixing, and mastering. The SPDIF (phono) and AES/EBU (XLR) I/O are available simultaneously thanks to separated recording and playback devices in the form of separate cards. RayDAT provides 4 x ADAT optical I/O, SPDIF I/O and AES/EBU I/O for a total of 36 channels of inputs and outputs along with two banks of MIDI I/O and TotalMix, RME's DSP-based real-time mixer/router. HDSPe RayDAT is a true professional solution! Legacy: HDSPe RayDAT is the newly developed PCI Express version of the HDSP 9652. A genuine PCI Express core consequently takes full advantage of the new format, achieving significant performance gains in multitrack audio. Thanks to RME's secure flash update technology, firmware improvements, adjustments, and bugfixes can be installed easily at any time. SteadyClock: HDSPe RayDAT includes SteadyClock, RME's own clock technology, combining professional features like maximum jitter suppression at full varipitch capabilities and software controlled sample rates. This keeps your signal as pure as possible, devoid of unwanted digital artifacts. Software and compatibility: DIGICheck for Windows: Spectral Analyzer, professional level meter for 2, 8, or 36 channels, Vector Audio Scope, various other audio analysis tools. Drivers are included for Windows 2000/XP/Vista/64 (full ASIO multi-client operation of WDM, GSIF 2.0 and ASIO 2.0), Mac OS X Intel (Core Audio and Core MIDI). 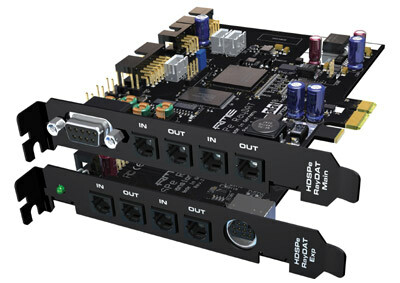 Unique features: The HDSPe RayDAT provides unique features, including 4 x ADAT digital I/O, supporting 192 kHz via S/MUX4 operation; 1 x SPDIF digital I/O, 192 kHz-capable, 1 x AES/EBU digital I/O, 192 kHz-capable; 2 x MIDI I/O, 32 channels high-speed MIDI via breakout cable; up to 36 inputs and 36 outputs can be used simultaneously; DIGICheck, RMEs unique metering- and analyzing tool; TotalMix: 2592 channel mixer with 42 bit internal resolution; Native PCI Express - no PCI to PCI Express bridge used; S/MUX poured in hardware: 16 channels 24-bit/96kHz for record and playback on ADAT optical.